The Undertones formed in 1976 in Derry, Ireland. Practicing in their bedrooms eventually led to the band recording ‘Teenage Kicks’ in 1978 on Terri Hooley’s Good Vibrations label in Belfast. The legendary DJ John Peel received a copy and liked it so much he played it twice in a row on his radio show. The rest, as they say, is history. They’ll be performing on Sunday 5th August at Wickham Festival 2018. The Undertones signed with Sire Records and ‘Teenage Kicks’ was re-released, resulting in the band’s first appearance on Top Of The Pops. Over the next five years, John O Neill, his younger brother Damian, Feargal Sharkey, Billy Doherty and Michael Bradley crafted further numerous punkpop gems such as `Here Comes The Summer`, ‘Jimmy Jimmy`, `My Perfect Cousin`, `You’ve Got My Number (Why Don’t You Use It)’ and ‘Wednesday Week’. They also recorded four highly acclaimed LPs. Indeed, they almost enjoyed the life of professional musicians. In 1983 Feargal Sharkey left the band to pursue a solo career and the remaining members decided to call it a day. The Undertones were to remain silent for the next sixteen years. 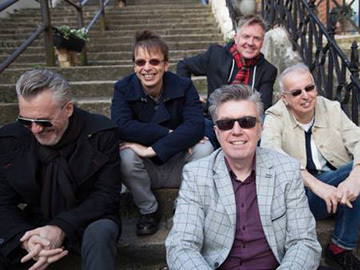 In 1999 The Undertones reconvened, without Feargal Sharkey, to once again perform their two-minute, three and a half chord songs to a new generation of fans in Derry. Fellow Derryman Paul McLoone replaced Sharkey on vocals and his vocal prowess and electric onstage presence soon convinced any doubters that he was more than capable of doing the job. After much consideration the band released a new CD of new songs called `Get What You Need’, which was critically acclaimed by Q magazine, Uncut, Rolling Stone and Hot Press. Songs like ‘Thrill Me’, ‘I Need Your Love The Way It Used To Be’ and ‘Everything But You’ showed that the art of writing short, sharp songs had not been lost over the previous two decades. In 2016 the band marked their 40th anniversary with their reputation as a scorching live act with festivals and club shows booked around the world. the drummer ......"At one time John had suggested that I should be the lead guitar player for the band but I had my heart set on the drums. I always wanted to be a drummer since I was 8 years old. During the fledgling years of the Undertones I didn’t have a drum kit just a set of bongos, which I bought in 1975 from Paddy Rice’s record shop in Carlisle road. It was the only percussive instrument, which I could afford. I had to use them on band rehearsals for songs like “Ballad of John and Yoko” and “Jumping Jack Flash”. I still have those bongos. Before having the bongos I would have to practice on cushions, arm rests, kitchen tables, school desks, you name it I hit it. Damian with The Chords at a recent show at the 100 Club! The rehearsals for the tour are going swimmingly, we can't wait!! Working on set lists..any suggestions?